Far from the bustle of Broughton Street and the regular racket of the river, there is a quiet little town called Ellabell, that Donna McKissick calls her home. It is a half-acre haven, eighty miles from where she works, which offers her refuge from the daily grind. With screeching tires and sirens replaced by the sounds of cicadas, and far-removed from the ever-present glow of city lights, Donna loves to relax watching the moon and the stars shine like brilliant paint spatters on a charcoal canvas. This quiet country home is a place where she can read and do crafts, dream of her next trip to see her grandchildren, and of course, care for her “babies,” the dozen vibrant orchids that she cherishes. But despite her tranquil surroundings, Donna’s life has not always been an easy journey. A little more than two years ago, a diagnosis of breast cancer would change the trajectory of her life forever. There would be hard times, painful treatments, and moments of despair. But through her journey, Donna would find strength she never knew that she possessed. Above all, she would learn that survivors, much like her beloved orchids, are always in bloom. The financial burdens of healthcare are real and remain an enormous obstacle for those in our community to get the care that they need. What Donna didn’t know at the time is that this is where organizations like Susan G. Komen come in, funding local programs that provide access to care for men and women who may not be able to pay for necessary treatment and screenings. To-date, more than a hundres people have had treatable breast cancers detected because of the support that they received from Susan G. Komen of Coastal Georgia. 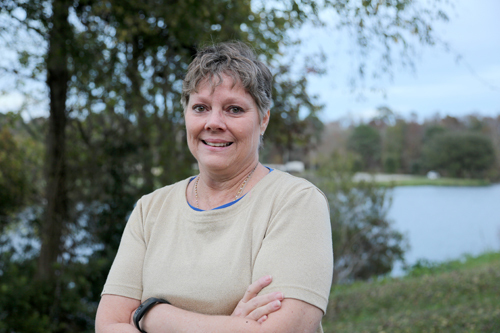 Donna’s story, like that of any survivor, does not end with her final treatment. Because of the courage that she had to fight, there will be more good days. There will be trips to Perry and to Lexington to see grandchildren. There will be ball games and gymnastics meets to watch and games of Bunco to play, and someday soon there will be more convertible rides with the top down. Because she chose not to give up when it mattered most, Donna’s future will be as bright and hopeful as those orchids that she adores.